I have just finished reading a great book on cultural differences as it applies to working with multicultural teams. 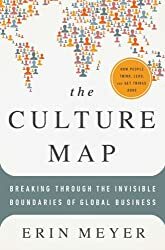 The book: The Culture Map: Breaking Through the Invisible Boundaries of Global Business is filled with fascinating real-life stories of how cultural differences impact relationships between people working together. The author, Erin Meyer, is an American living in Paris and a professor at INSEAD, the “Business School for the World”. She trains leaders from many different cultures of the world. No, the book is not written specifically for missionaries, but is nevertheless a very valuable resource for anyone working in a cross-cultural environment, and particularly those who serve on multicultural teams. Based on extensive research and experience, Meyer has come to realize that you cannot simply categorize cultures into two camps on a particular issue. For example, cultures are not simply time-oriented or event-oriented. The English see the French as not punctual and disorganized, but Indians see the French as too rigid in terms of time! Both are right – from their vantage point. And from yet another place on the spectrum, the Germans see the English as being “disorganized, chaotic and always late” (p. 22). See the diagram below that compares Israeli (red) and Russia (yellow) cultural maps. So we see that cultures are scattered across a spectrum, and what matters is not a culture’s absolute position on the spectrum, but rather its relative position in comparison to the culture it is interfacing with. Communicating – To what extent does the culture prefer low-context or high-context communication? Evaluating – Does the culture tend to criticize directly or indirectly? Persuading – Does the culture start with principles first or applications first in proving a point? Leading – Where does the culture lie on the egalitarian — hierarchical spectrum? Deciding – Are decisions primarily consensual or top-down? Not necessarily linked to where they are on the egalitarian/ hierarchical scale. Trusting – Why do people trust one another? Because they have a relationship with one another or because they work together? Disagreeing – Does the culture view confrontation helpful or harmful? Scheduling – Is time viewed more in a linear fashion or more as flexible? She discusses each of these areas in some depth, and then very helpfully charts a number of significant cultures on the spectrum of possible responses to these questions. You can quickly see that a culture may be very similar to another in one area, but differ very significantly in another seemingly related area. For example, both Russia and Japan are both quite hierarchical (with Japan even more so than Russia). But on the Deciding scale, they are almost at opposite poles. Japan is very strongly consensual whereas Russia is strongly top-down. No wonder I was confused when I, as a Canadian, sought to help a Japanese missionary interface and make decisions together with Russian pastors! At the end of each chapter on each of these value areas, the author gives several helpful tips on how people with these differing cultural tendencies can better communicate and work with one another. How do you lead if you are from an egalitarian culture, but you are leading team members from those who come from more of a hierarchical culture? Or the reverse? Meyer provides helpful suggestions to deal with both scenarios. She also addresses what you do when your team is a blend of multiple cultures. For example, multicultural teams must learn to communicate in low-context ways because the multicultural environment confuses the cues that are necessary for high-context communication. On teams where you have a blend of more hierarchical and more egalitarian cultures, “define team protocols up front” (p. 138). Would you like to know where you fall on the spectrum in each of these cultural scales? The author’s website points to an online self-assessment in the Harvard Business Review. The self-assessment is based on the book and charts your cultural preferences in comparison to your country’s cultural average or norm on each of these eight scales. I was significantly off the Canadian norm on the majority of the 8 scales. But what was even more interesting was that our son (an MK who grew up in the Philippines, Russia and South Korea) also took the test and he was even further off the Canadian norm. Almost without exception, he was double my distance from the Canadian norm on each of the eight scales, and was closer to the Philippine, Russian and Korean norms than he was to the Canadian norm. This provided a fascinating picture into how living overseas as an MK has impacted his cultural values. Too busy to read the book? You can also get a good introduction to the eight scales in a Harvard Business Review article written by the same author, entitled Navigating the Cultural Minefield. An even more accessible introduction to these work can be found in an 11-minute fascinating lecture by the author on her website. I read this book a few months ago and found it extremely helpful in navigating business meetings we were having! I also highly recommend this book. While it doesn’t talk directly about the Philippines a lot, I had a language teacher explain some of the points from his perspective (while also explaining how subcultures – Chinese, Japanese, Spanish, etc- here fall as well).